When reviewing electrical power options for remote (often times off-grid) regions, there are three primary options one would likely consider: Solar Power, a Diesel Powered Generator or a Wind Turbine. Comparing these three is interesting, but not always equivalent. For this example, we’ll use a typical scenario for the Uprise Energy 50kW portable wind turbine as the basis for comparison. In an average wind speed of 12mph, the Uprise Energy Portable Power Center (PPC) will produce 12kW of electrical power. When factoring the cost of the machine, along with operation and maintenance expenses over a 20 year lifecycle, an average windspeed of 12mph will equate to an energy cost of 10 cents per kilowatt-hour. Stronger wind conditions will reduce energy costs, with potential to be as low as 3 cents per kWhr. Maximum power of the Uprise Energy portable wind generator is 50kW. In contrast, if a 50kW diesel generator were used to produce 12kW, it would have very poor efficiency (BSFC), so a 15kW generator should be chosen. To produce 12kW/hr, the diesel generator will burn a minimum of 1 gallon of diesel fuel per hour, depending on efficiency or a minimum of 175,200 gallons over 20 years IF it is properly loaded. Diesel powered generators are reliable and convenient to use. Depending on fuel prices and machine efficiency, power will range from $1-40 per kWhr. Diesel fuel is the most power dense, relatively portable and reliable. Diesel fuel is also the most expensive, non-renewable and produces greenhouse gasses. A best-case diesel power scenario would be an initial generator cost of $20,000 plus $1,000,000 in fuel costs. Shipping, operation and maintenance expenses would also need to be added. 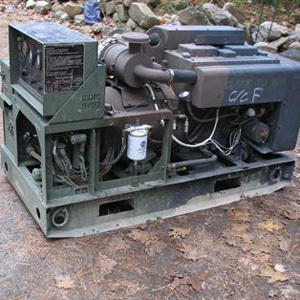 Depending on load factor (BSFC) and cost of fuel, a diesel generator will make power in the range of $1 to $40 per kWhr. Maximum power is limited to 15 kW. A solar system's capacity factor is about 12%; therefore, a 100 kW system must be purchased to produce an average of 12 kW. The average panel size is 18 SF, costs $400 and produces 200 watts when new and then degrades from there. Additional losses occur from inverter and transformer heat, plus extra cost to service, maintain and replace panels as needed. Solar panels only make power an average of 5hrs per day and are not portable. A contemporary solar system capable of producing an average of 12kW will produce power for approximately 19 cents per kWhr. A 100 kW solar system would extend approximately 10,000 SF and requires a significant installation mounting system. Unlike the Uprise Energy Portable Power Center and diesel generator, a solar system is not portable and requires well over 10X the space. Lifecycle costs for the solar array is approximately $300,000 with a best-case average cost of 19 cents per kilowatt-hour. Maximum power is limited to 100 kW at peak sun angle, which is not realistically achievable. Due to the limited power production throughout the day with a solar system, the need to store power is elevated unless another form of power is available to the consumer. If you have questions about the above or would like to continue the discussion, please use the comments section below. Thanks for reading!